A practical guide to research-just for architects From searching for the best glass to prevent glare to determining how clients might react to color choice for restaurant walls, research is a crucial tool that architects must master in order to effectively address the technical, aesthetic, and behavioral issues that arise in their work. This book's unique coverage of research methods is specifically targeted to help professional designers and researchers better conduct and understand research. Part I explores basic research issues and concepts, and includes chapters on relating theory to method and design to research. Part II gives a comprehensive treatment of specific strategies for investigating built forms. In all, the book covers seven types of research, including historical, qualitative, correlational, experimental, simulation and modeling, logical argumentation, and case study and mixed methods. 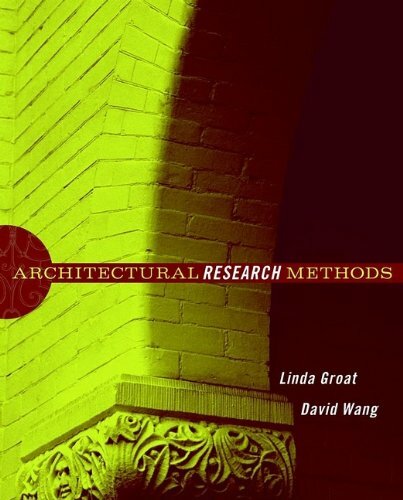 Complete with real-life examples of how good research can be used from project inception to completion, Architectural Research Methods is an essential reference for architecture students and researchers as well as architects, interior designers, landscape architects, and building product manufacturers. LINDA GROAT is Professor of Architecture at the University of Michigan's Taubman College of Architecture and Urban Planning. DAVID WANG is Associate Professor of Architecture and Coordinator of the Master of Science in Architecture program at Washington State University's Interdisciplinary Design Institute in Spokane, Washington.